I’m getting our outside “To Do” list out and we’re ready to tackle a project that is long overdue. We live on a corner lot with a side yard, instead of a back yard, and around this side yard we have a wooden fence, that was here when we bought the house almost two years ago. 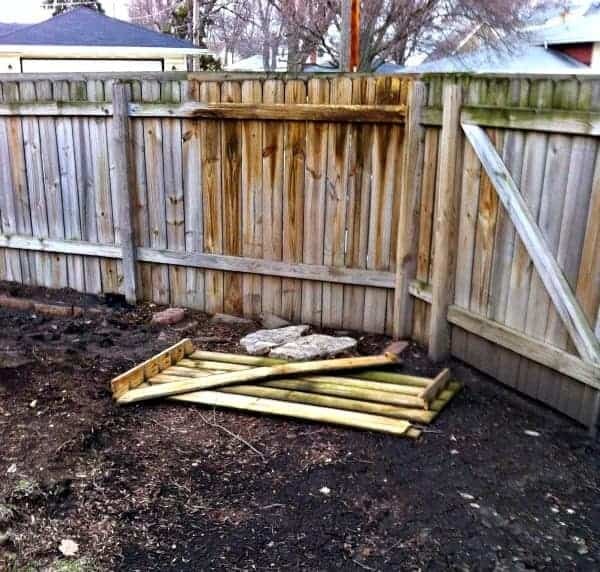 We’ve had a lot of conversations about this fence in those two years…should it stay, should it go, should we take down part of it, should I secretly take a sledgehammer to it when hubs is away on business…you get the idea. I’ve never liked the fence but after two years I do see the benefits of the privacy it provides as we are on a busy road with people walking by all the time. 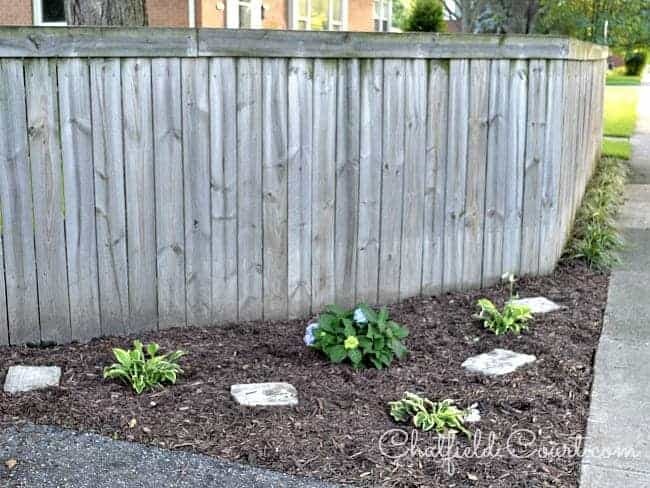 We’ve done a few things to improve the look of the fence, including taking down the gate, that hung crooked and would never close, and removing a funky little roof on one section of the fence, we think the previous owners stored their garbage cans under it. But it was time to get serious about the ugly mold covering most of the fence, so we recently spent a Saturday cleaning it. This was one of those projects that really needed to get done but was put off so many times because we thought it would take hours to do. The fence was looking so bad though, that we couldn’t ignore it anymore and got to work. First we tried a few easy things, like taking a scrub brush and some warm soapy water to it, but it didn’t do a thing to the mold. 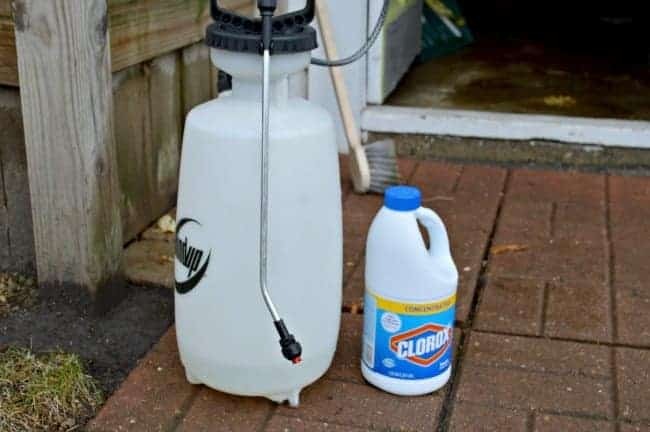 Next we tried some bleach and water in a lawn and garden spray bottle, but that did nothing to remove the mold either so it was time to bring in the big guns. We ended up using liquid chlorine (typically used in swimming pools) that was purchased from Home Depot. This stuff is potent so we diluted it with water in the sprayer and applied it to the fence. 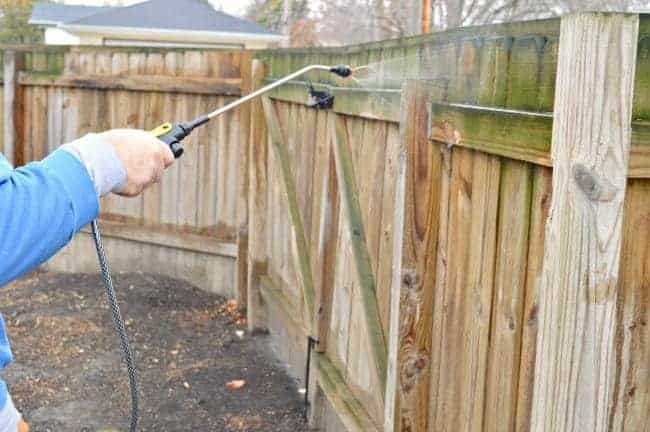 A good tip to remember is that when you spray the solution on the fence you want to be sure to start at the bottom and work your way up (working from the top down could result in streaks). You also want to be sure to wear some old clothes and protective eyewear. The solution worked like magic and the mold disappeared almost immediately. After a section of fence was sprayed, we let the solution do its job for about 15 minutes, then we rinsed it with the hose. Because the liquid bleach is so potent, we made sure to hose the area down around the fence, really, really well, so we didn’t harm our plants or grass. 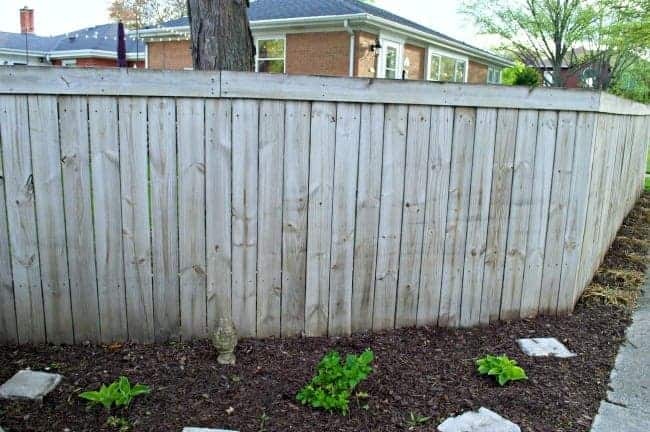 It took no time to spray the whole fence and once it was dry it looked almost brand new. There’s still a few stubborn spots we need to scrub, but it looks 100% better. Now I can officially cross this one off the “To Do” list. Yay! Do you have a “To Do” list? Does it make you happy to cross completed projects off of it too? We just poer wash ours with no chemicals. Works great! We have a painted wood deck that has a green mold in areas. Do you think your chlorine mixture would work on that? Hi, Mariya! 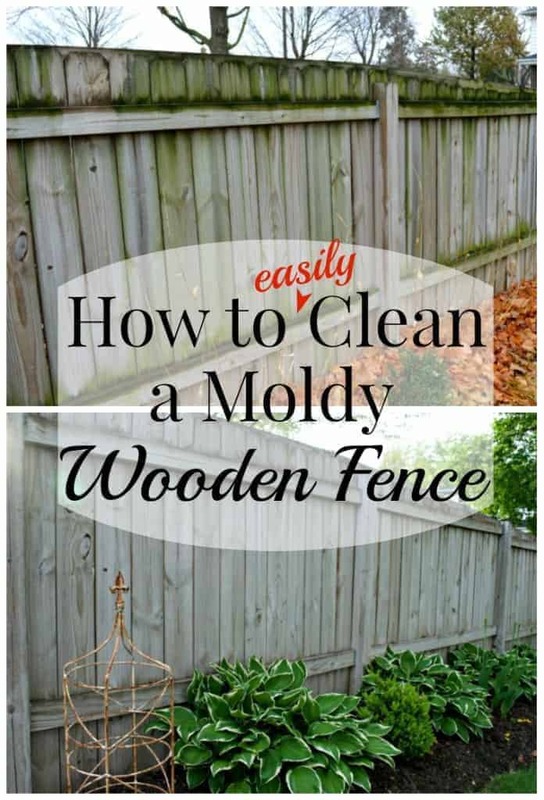 We have used the same mixture on our wooden deck and it definitely works. It will bleach the wood a bit, so be prepared for that. Can you tell me the names of the perrenials? Those are so nice ! Thanks so much Kristi !! Hi Kristi. I believe that is a boxwood in between the hosta. I wanted to see a little green in the winter once the hosta died away and they were great for that but I planted them a little too close together. Hope that helps. 🙂 Have a great weekend. How much did you delude chlorine? Thanks for your question Deb. We used equal parts of chlorine and water. We tried a lesser amount but it just wouldn’t cut it. 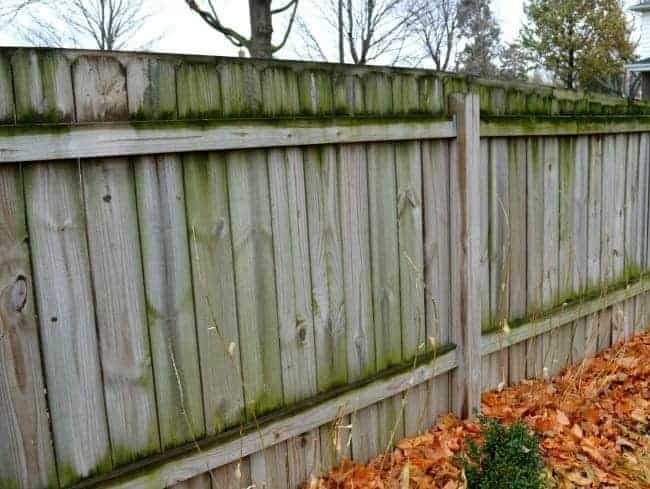 Just remember to hose down the area that the mixture was used in after you finished the fence. Hope that helps. Did it do damage to the plants and grass? Did you cover them up with a tarp? 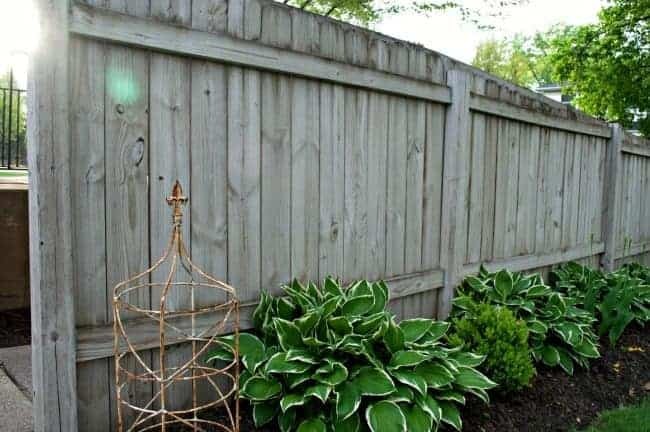 Would like to do this but concerned about the plants. I was concerned too but we had no damage to any of my plants or grass. I did clean the fence before my perennials came up, but the few bushes that I have in this area did fine. We also made sure to really hose down the area we worked in after cleaning. Hope this answers your questions. Thanks Rue! So glad you are feeling better. 🙂 Hope you have a great weekend. Looks great Kristi. That is not a fun job, but it looks like you found a way to make it easier. We have a corner lot, too, and a big fence. I wasn’t fond of the idea initially, but I do like the privacy! Thanks Kim. It wasn’t a fun job but once we figured out how to remove the mold, it went pretty quick. Nice job Kristi! Yes, I have a “To Do”, but I keep adding and it seems to get longer and longer instead of shorter! Ha! Gotta send you those photos I talked about. I haven’t been feeling up to par for a few days. I think I caught a bug. It doesn’t seem to knock me down completely, just don’t feel like to doing anything or eating too much. Hope it gets better soon because I’m off next week and going to tackle that “To Do” list!